1Lt John H. Cook (P) - Flew as a CoPilot on 16 credited missions with seven different Pilots: 2Lt Arnold S. Litman (88 - 13 Dec 1943); 1Lt Lester A. Lake, Jr. (94, 97, 101); 2Lt Robert W. Snyder (102, 103, 105, 106, 109, 112, 113); 2Lt Jack W. Watson (108); 1Lt Joe R. Worthley (110, 111); 1Lt Thomas R. McClure (136, 137 on 22 April 1944); 1Lt Joseph R. Moreau (153). Updated from CoPilot to Pilot on orders dated 01 May 1944 and flew his first mission as 1st Pilot on 30 April 1944. Flew 17 missions as a 1st Pilot (145 - 30 April 1944, 146, 151, 152, 157, 161, 164, 167, 170, 171, 172, 176, 180, 181, 183, 184, 186 - 20 June 1944). Last fourteen 1st Pilot missions as a Squadron Lead Crew Pilot. 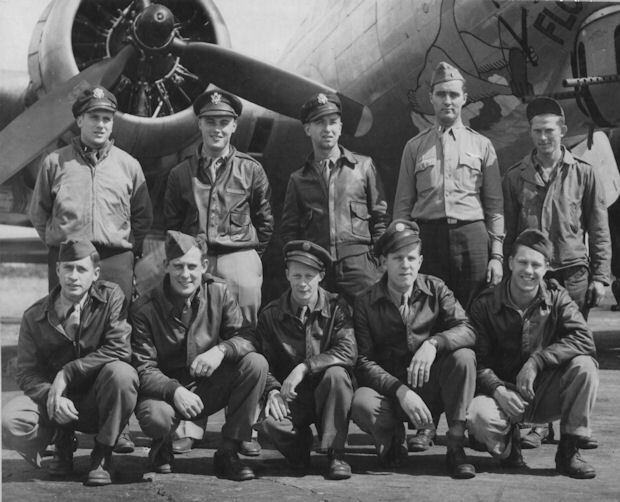 Eleven of the seventeen 1st Pilot missions were flown in B-17G #42-97198 The Floose (358th BS) VK-H). Sgt Grant W. Vanderhoff (BTG) - (10 missions) - 4 additional Ball Turret Gunners used. S/Sgt Robert L. Stone, Jr. (LWG) - (7 missions) - 4 additional LWG's used Crew size changed from 10 to 9 men following mission #183, 18 June 1944, when one of the Waist Gunner positions was eliminated.